Morača is one of most beautiful river canyons in Montenegro which separate the Moracke mountain range from the Sinjajevina range. It originates in northern Montenegro, under Rzača mountain. It generally flows southwards for some 113 kilometer (70 mi), before emptying into the Skadarsko Jezero. 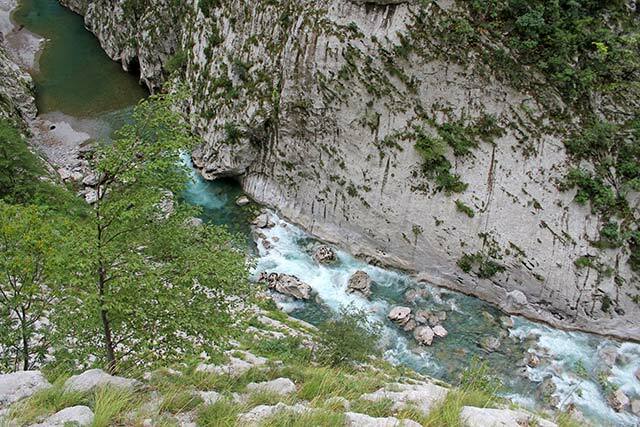 In its northern part, the Morača is a fast mountain river, and has cut a canyon north of Podgorica. After merging with its largest tributary, Zeta, just north of Podgorica, the Morača enters the Zeta plain. It flows through this flat area of Montenegro until it empties into Skadarsko Jezero. The Morača river is the biggest tributary of Skadarsko Jezero. Its source is at the height of 975 meters above sea level. In the Kolašin region, the Morača’s tributaries are the Koštanica, Sjevernica, Trnovačka Rijeka, Javorski Potok, and the Slatina, on the Mrtvica, Ibrištica, Ratnja, and the Slatina, on the left, and the Mrtvica, Ibrištica, Ratnja and the Požanjski Potok on the right. Apart from the Morača’s platije canyon, its right-hand tributary the Mrtvica also flows, for the most part of its length, trough a lesser known high canyon of breathtaking beauty. The region in the basin of the Morača river is featured by the steep slope of the terrain. 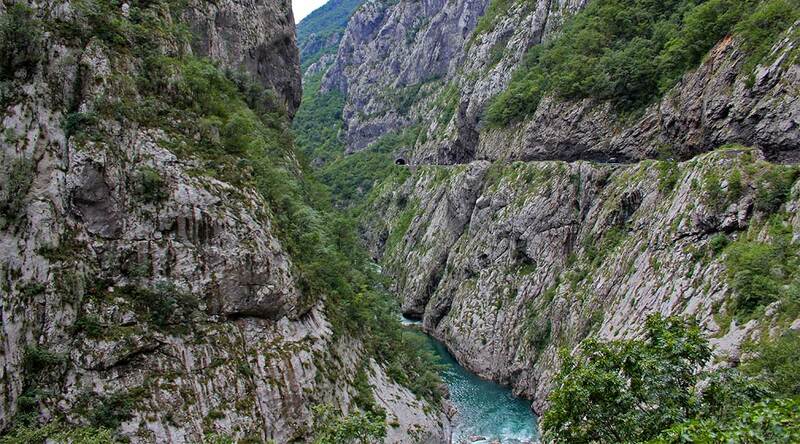 It is intersected by deep gorges and canyons.The upper part of this river valley stretches to the entrance in the Platije canyon, which consists of Gornja Morača, at an altitude ranging between 465 meter and 973 meter, and two more expansions. 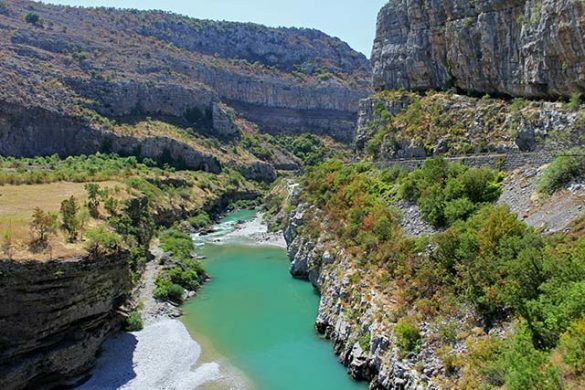 The Platija canyon is 1000 meters deep on average and the mountainous Morača’s tributaries also flow through the canyons with the banks often as high as up to 1000 meters. The Morača river basin is oriented to the Adriatic Sea while the Tara river basin pertains to the drainage system flowing into the Black Sea. The Crkvina saddle, situated between Morača and Kolašin monasteries, is the watershed of the two basins. On its southern side, waters flow towards the Adriatic Sea, and on its northeast side, the waters flow through the Tara, Drina, Sava and the Danube Rivers, reaching the Black Sea. The curiosity is that the waters split on the roof of a building on this saddle and flow into two different basins. The Morača canyon is one of the wider ravines of Montenegro and is mainly visited as a road to the northern part of Montenegro or Serbia. This road straight through the ravine along the cliffs is known for its beauty and the fact that you occasionally have to be at the disposal of strong nerves through the freight traffic that drives through here. The road together with the Morača monastery are the tourist attractions of the ravine. In addition to the towns in the vicinity of the ravine, there are some accommodations along the way through the ravine. These are mainly aimed at the passing traffic and motorcyclists who are lovers of winding roads. Hostel Izvor – Hostel Izvor is quietly located 5 kilometers from the town of Podgorica, by the Moraca river. Reception is open 24 hours a day and you can park for free on site. All rooms are comfortably furnished and offer free Wi-Fi. The guest house has a bar and a restaurant, serving traditional Montenegrin dishes. Here you can enjoy the beautiful Moraca ravine and the many hiking trails. Facilities : Bar, Restaurant, Sun terrace, Free Wi-Fi Internet Access Included, Free Parking, 24-Hour Front Desk, Airport Shuttle (surcharge), Pets Allowed, Electric Vehicle Charging Point, Laundry (surcharge), Car Hire.